Join in and write your own page! It's easy to do. How? Simply click here to return to Glamping or Camping? That is the question!. We are the parents of a very active 3 year old, his 3 dogs, and 2 turtles. We live in Dallas,Texas and love the city life but also want our son to appreciate the amazing public lands offered in this country. We have a 40ft Holiday Ramber Scepter and have been traveling with our little family since our child was born. The RV offers us a safe way to transport our child and pets while also enjoying the outdoor life. My husband has a very demanding job as an IT executive and I spend much of my time volunteering for important causes in our community. 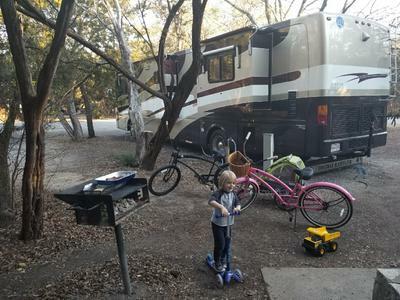 Traveling by RV has allowed us to see much of Texas and the East Coast of the United States conveniently with our family while offering internet etc. And a weekend office when needed to keep us connected to our busy lives in Dallas. Cheers to Glamping!! !